ALBUQUERQUE, N.M. – In the chemistry labs of the developing world, it’s not uncommon to find containers, forgotten on shelves, with only vague clues to their origins. The label, if there is one, is rubbed away. 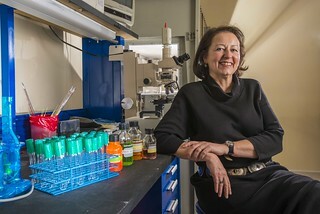 Sandia chemical engineer Nancy Jackson has worked in laboratories around the world to help ensure that chemicals are used safely and kept secure. The American Association for the Advancement of Science is honoring her with the 2013 Science Diplomacy Award on Friday, Feb. 15. (Photo by Randy Montoya) Click on the thumbnail for a high-resolution image. Left alone for years, some chemicals can quietly break down into explosive elixirs, and what was once an innocent experiment by a well-meaning scientist becomes a very real, unsecured threat. Should such chemicals fall into malicious hands, the consequences could be widespread and deadly. In 2007, Sandia chemical engineer Nancy Jackson helped the U.S. Department of State create the Chemical Security Engagement Program to help scientists around the world, particularly in developing countries, keep chemical use safe and secure. Jackson and her team develop and implement programs for laboratories worldwide to help manage their chemical inventories and devote time to training future laboratory trainers. As the 2011 president of the American Chemical Society and manager of Sandia’s International Chemical Threat Reduction program, Jackson has traveled and worked closely with scientists in some of the world’s most volatile regions to make their laboratories more safe and secure. For her extensive work engaging scientists around the world, the American Association for the Advancement of Science has honored Jackson with the 2013 Science Diplomacy Award, which will be presented on Friday, Feb. 15, at the AAAS annual meeting in Boston. The program’s goal is identifying chemicals that can cause catastrophe in the wrong hands, and making sure they stay out of those hands. One challenge facing Jackson and her team is that many laboratory chemicals are dual use, with both helpful and destructive applications. Take potassium cyanide. While cyanide is used to manufacture plastics, textiles and paper, develop photographs and remove gold from its ore, when paired with an acid, cyanide can easily be turned into a deadly gas. Jackson and her team work with universities, small businesses and research institutions to build extensive chemical inventories so organizations can know and manage what they have. With such inventories, chemicals are less likely to go missing, and sharing resources between scientists is easier, driving down costs and wait times associated with ordering new products. The program regularly engages scientists in the Middle East and Southeast Asia, where Jackson says chemists and chemical engineers understand the importance of keeping chemicals guarded, but often don’t have the resources or training to implement security systems. Jackson and her team have developed five-day, train-the-trainer programs for chemists and chemical engineers that teach the importance of personal protective equipment, maintaining working chemical hoods, chemical management and physical security. The goal is to educate professors and researchers so that program graduates will be aware of safety and security measures, thus sustaining the program for future graduates. Sandia National Laboratories is a multi-program laboratory operated by Sandia Corporation, a wholly owned subsidiary of Lockheed Martin company, for the U.S. Department of Energy’s National Nuclear Security Administration. With main facilities in Albuquerque, N.M., and Livermore, Calif., Sandia has major R&D responsibilities in national security, energy and environmental technologies and economic competitiveness.